In an effort to report an epic flight that might have gone unnoticed, and partly to remove that disturbing picture of Claude and the alien baby that festered within his body for months, I have decided to write this article. I always find days with excellent conditions and great flying inspiring, and last Sunday the 17th was that kind of day. I got a call early in the day from Don that conditions on the Koolaus looked epic. I couldn't get free but Don, Jetflap and Frank headed out to Hygienic Store. They reported stellar conditions and I believe it was a first time for Frank. The only complaint I heard was that after they landed they felt they should have gone further. I even lifted one of Frank's photos. I arrived at Crazy Man's to find a whole bunch of guys launching in the strengthening conditions. Doug was on launch with his brand new UP Targa 3, his super comp glider. Doug launched, I launched and Ray launched into the strong easterly conditions. Doug headed out first reporting 40+ mph groundspeed from the Ironwooods back into Waimanalo. At that point wind conditions didn't seem all that ideal for some real downrange action, but with a strong pull from Doug and his Targa, Ray and I chased him along as best we could. Ray and I got low coming around the Pali, and in climbing back to the 3000' cloudbase Doug left us for good. It was a very hazy day high up and I got an occasional glimpse of him for a little while. Cloudbase was slowly dropping and the wind was building further from a more northerly headwind direction. Ray decided to head into the Hygienic Store. I entertained the thought of getting up on the front of the Pyramid (Ohulehule) and flying around the front of Kualoa and on, but the slow forward progress had me fly back to land next to Ray. Doug had already headed out through Boogaboogaland which he reported to be bumpy, at which point we lost contact with him. Ray and I got a ride back to Makapuu from his buddy and waited for contact from Doug. Ray got a call a little while later that Doug was at Kahana or at Kualoa, and what I didn't understand at the time was that he was still flying. Doug called us back around dark to report that he landed back in Waikane Valley, in the same spot I had landed a month ago, and was packing up and heading out. By the time I got out that way it was totally dark and Doug reported that he was having trouble finding his way out. I asked the 4-wheelers at the end of the road if they saw a paraglider land. Out of the back steps a young kid who says he saw him land and gave Doug a bottle of water. Both the father and I give the kid a skeptical look, but we realize that he is telling the truth. I followed the 4X4's in my van down the dirt road to find Doug in near total darkness. Doug tells me that he had flown through Booga's out of Green Valley and decided that it was boring to head downwind to Kahuku (and a possible distance record). He jumped over to Kahana and soared there, crossed the bay to Kaawa and then Kualoa. 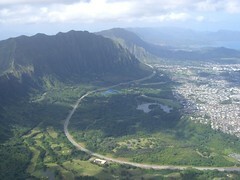 Jumped back to the Pyramid and reported bad air in the lee of Kualoa and was arriving at the main Koolau ridge for a possible return flight to Makapuu. He was low on the main ridge and decided to go land in Waikane on that nice tabletop ridge they have back there. All in all not bad for a first flight on a new glider -- expect more in the future. I know there are more tales from the day and I would enjoy reading about them all. Dave, what a great report. Your story has successfully pushed Scrappy's alien spawn further down the page (thank you), and it also allows the rest of us to rekindle our feelings of envy and resentment, I mean, respect and admiration. I'm crossing my fingers for more days like that before the winter is over. See you guys in January! I wonder what it's like to be Doug. By the time I got back to Makapuu with Doug it was closer to 8pm. Bad weather friends! If it is good, we are gone. Thanks anyway.